We bought Braefield as a small cottage in 2007. In 2010 the house underwent a complete facelift. The enormous roof space was converted and turned into new bedrooms with dormer windows. 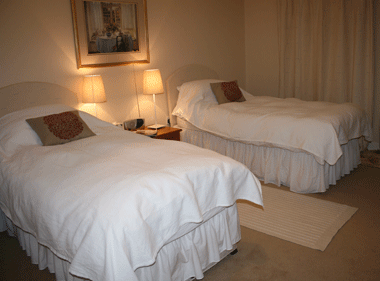 New living spaces were created downstairs, together with an en suite bedroom used by guests. 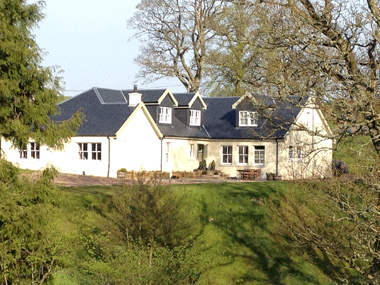 The house now boasts plenty of space and enjoys spectacular views over its eight acres of garden and farmland. Combined with functioning stables and smallholding, Braefield offers the perfect blend of rural retreat and modern comfort. In 2015, a further ensuite bathroom was added to the upstairs guest bedroom which is now available for booking, and in 2017 a garden room added to the dining room which is available for guests to relax in. Braefield lends itself to being a cosy, comfortable base for your holiday or an ideal stopping point to re-charge when travelling north and south or whilst on business in the area. The spacious bedrooms both offer twin beds with extremely (and much remarked upon) comfortable mattresses , cosy feather down duvets, feather pillows (hypoallergenic available on request) and crisp cotton bed linen. One bedroom is situated downstairs with private vestibule and en suite bathroom with underfloor heating, rain power shower and a deep cast iron roll top bath. 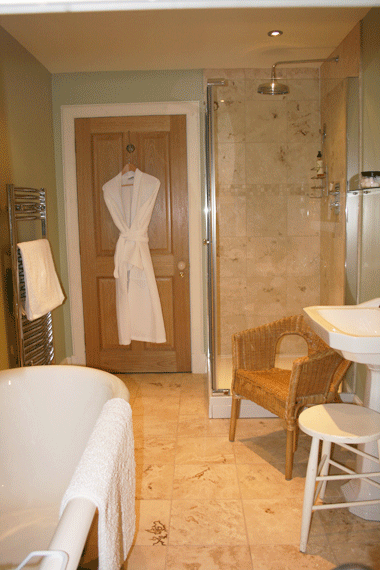 The second bedroom is upstairs and is also ensuite with a power rain shower. Locally handmade natural toiletries are used and hairdryers, radios, and bathrobes are provided. Each room has its own television, free access to wifi, and a coffee machine/tea making facilities. Excellent drying facilities are available too. Breakfast is served in the dining room. We try if possible to provide you with our own or local produce including homemade jams and marmalade, delicious bacon and sausages, as well as tea, coffee and fresh orange juice. A continental breakfast includes croissant and muffins. Special diets can be catered for with prior arrangement. Caroline is a keen and experienced cook. If you would like either a packed lunch or simple dinner please discuss this in advance. The emphasis is on good ingredients cooked in a delicious and simple way.